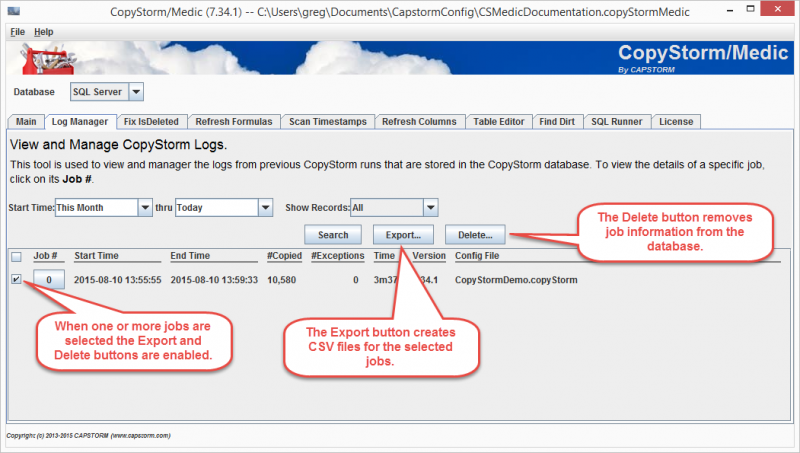 The CopyStorm/Medic Log Manager tool supports the viewing, management, and exporting of the results of previously run CopyStorm jobs. Starting with version 7.*. *, CopyStorm stores the status of each job into tables in the CopyStorm target database. The CopyStorm/Medic Log Manager is a convenient tool for viewing, managing, and exporting the contents of these tables. 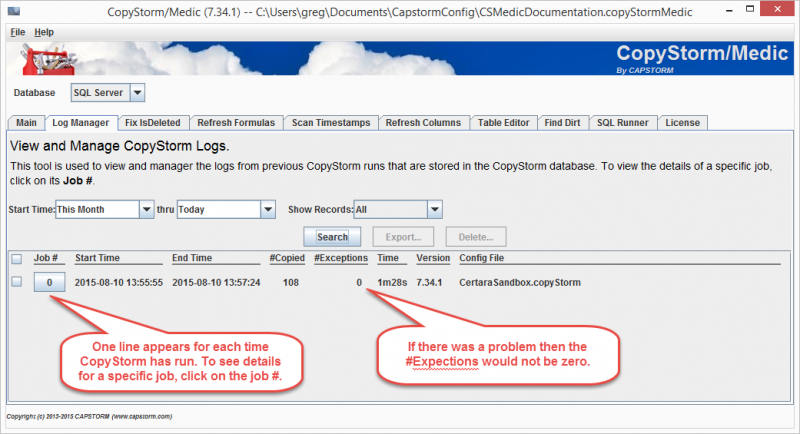 In addition to Log Manager, regular RDBMS tools can be used to access CopyStorm’s logs. Clicking the Search button will find all jobs that match the specified date range. The “Tables With Activity” tab lists statistics for each table which had inserted or updated records during the job. The “Exceptions” tab lists all errors that occurred during the job. ExportFile.csv contains top-level information about each selected job. ExportFileTables.csv contains one line for each table that was updated in the selected jobs. ExportFileExceptions.csv contains one line for each exception that occurred in the selected jobs. In addition to the columns displayed in the CopyStorm/Medic GUI, each exported row will also contain the JobId. The status for selected jobs can be completely deleted from the CopyStorm database by clicking on the Delete button. The tool will ask you to confirm the deletion, as once performed the deletion is irreversible.